I happened to find myself in Canberra on the night of the 2004 Federal election. It was a short night, but a long morning after. As the day stretched out ahead, some words from 4th century theologian Saint Jerome came to my mind. Strange as it may now seem, what leaders and thinkers believed about Christ once literally determined the shape and colour of kingdoms. It was in the year 360AD that Jerome, beleaguered champion of orthodox christology, uttered his famous lament: "the whole world groaned to find itself Arian." The details of that theological debate and the nature of what Arius argued needn’t concern us here. But Jerome’s saying was consonant with my own thoughts after the election. It seemed that the whole world – or at least a significant majority of the Australian electorate – had acceded to the Howard view of life and the universe. And that left me deeply unsettled and not a little pessimistic. Yes the people had spoken; yes I was able to take comfort in having the right to choose our government, and the right to dissent the choice of others. But the source of my discomfit went deeper than an initial desire to emigrate to New Zealand and/or cast suspicious looks at my fellow voters. (Is it the circles I mix in? I didn’t come across a single person who would openly admit to voting for John Howard!) What disturbed me more than anything was the alignment of the Howard view with the Christian faith. A couple of weeks later a remarkably similar scene was played out in the USA. This time there was an even more explicit alignment of the Bush campaign with certain Christian views. Not only was Bush able to retain the Evangelical vote, but even John Kerry’s own Catholicism benefitted him little, blunted by some Catholic leaders as good as declaring that a vote for Bush was a vote for God. They inundated churches with guides identifying abortion, gay marriage and stem cell research as "non-negotiable issues." Archbishop Charles J. Chaput, the highest-ranking Catholic leader in Colorado, saw an express link between these ‘evils’ and a vote for Kerry. "If you vote this way, are you cooperating in evil?" he asked. "And if you know you are cooperating in evil, should you go to confession? The answer is yes." He may have observed the letter of the law regarding the strict separation of church and state powers in the USA, but he had hardly observed its spirit. In Australia religion is much more a private matter. It might even be argued that our tradition sees religion as quite marginal to how we run our political system. 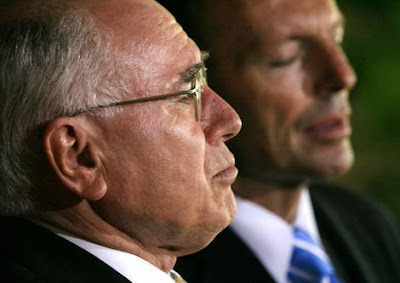 John Howard himself has been keen to silence the occasional dissent from "meddlesome priests" in the past. But this time around there was a peculiar alignment of conservative thinking, including many in the church and the media, that enabled the Howard government to remain unchallenged on a significant number of moral and ethical issues. Instead the Liberals, aided by groups such as Family First, openly if unofficially aligned with the Christian denomination the Assemblies of God, were able to tap into the socially conservative religious sentiment of a significant number of Australians. For these Christians the Greens are "extreme"; Labor is risky on economic and sometimes social grounds; and Howard is a fellow believer. For them material prosperity is a sign of God’s goodness, and the Howard government can help deliver this. So Family First gave and received preferences from the Liberals, and as a consequence looks likely to have an influential place in the senate. In both Australia and the USA this identification of conservative social/moral views with religious faith has gone largely unchallenged. From where I stand this is a major distortion of the Christian faith. How can lies about weapons of mass destruction and children overboard, or the extent of innocent victims of the war on Iraq, not carry the equivalent moral weight of abortion or gay marriage? How is it that the lives of Middle eastern citizens, refugees and asylum-seekers have less value than unborn Australians? And how can a US soldier about to attack the city of Falluja say on prime-time television "the enemy’s got a face … he’s called Satan" and fear no rebuke? Where are the voices from the pulpits and microphones pointing out the slick hypocrisy of these comfortable positions? Is there no truth filter through which such issues can be put? Surely for those who profess to follow Christ there is at least his teaching. The following examples seem instructive. It is well to remind ourselves that it was precisely the religious who most strongly opposed Jesus during his life. He wrapped some of his most powerful messages to them in story form. For instance one hypocritical religious leader is depicted as loudly praying "God, I thank you that I am not like other men – robbers, evildoers, adulterers – or even like this tax collector. I fast twice a week and give a tenth of all I get." The same tax collector "stood at a distance. He would not even look up to heaven, but beat his breast and said ‘God, have mercy on me, a sinner." (Luke 18:11-13) Jesus not only tells us that God heard the prayer of the latter, but demonstrates it in his own life by being known as "a friend of tax collectors and sinners" (Luke 7:34). In one particularly shocking passage Jesus said to the religious of his day: "You diligently study the Scriptures because you think that by them you possess eternal life. These are the Scriptures that testify about me, yet you refuse to come to me to have life." (John 5:39-40) This is a pointed challenge to today’s Evangelicals, those with whom Bush is most identified. As "people of the Book", the test of his teaching is to ask yourself: "Which has my prime allegiance: Christ or the bible?" There may not often be a conflict between the two, but if there is, it is clear that the Christian should choose Christ. Another major challenge to the comfortable "private" Christianity to which Bush and Howard so readily cosy up, is the issue of prosperity. That God can bless his people economically is only one side of the truth at best. There is far more weight given in Christ’s teaching to the dangers of wealth. For instance "it is easier for a camel to go through the eye of a needle than for a rich man to enter the kingdom of God." (Luke 18:25) There are also powerful warning stories such as the parable of the rich fool (Luke 12) and the parable of Dives and Lazarus (Luke 16), in which the rich loose everything including their souls. Why do I emphasise prosperity here? There seems little doubt that the hip pocket nerve was tickled during the election. Contrary to the opinion of most major banks and economists, the Australian electorate perceived that interest rates were more likely to stay low under a Howard government. That a good proportion of the "Christian" vote – as concerned as anyone to preserve their personal prosperity – was swayed by this thinking, is an indictment of the depth of their theology. Certainly the teachings of Jesus are no political manifesto, and they don’t prescribe economic policy. But to reduce Jesus’ teaching to a code of personal morality, and ignore its social and political implications, is to castrate it. To claim to follow Christ and yet have no critique of "mammon" is to risk ethical amputation. And so in Canberra, the day after the election, my thoughts remained gloomy. But they were eventually nudged forward nearly 1200 years from the time of Jerome to the time of Martin Luther. There were Christians in Luther’s day – also one of great turmoil – who were tempted to seek comfort only in the second coming of Christ. The trials and travails of this world would then be over, and God’s kingdom would be forever established. Someone asked Luther what he would do if he knew that Christ were returning the next day. A man well versed in paradox, he is reported to have replied: "If I believed the world were to end tomorrow, I would still plant a tree today." My Canberra friends probably had more 21st century thoughts in mind, ones that related to Canberra’s ongoing recovery from the devastating 2003 bushfires. But whatever our thoughts and feelings it was more than therapeutic for us to join over 300 Greening Australia volunteers in planting thousands of trees in the warzone that had once been Deek’s Forest. It was a powerful reminder that there are many good things that will outlast the rulers of this age. And there are still actions we can take that will make a difference whoever our rulers might be. Onya Dad. I totally agree. Just one thought: if there ever were a conflict between Christ and the Bible, how might a Christian discern the way of Christ, without reference to his Word? Divine revelation springs to mind, but also conjures concerns about legitimacy and accuracy. I would always feel a little wobbly going on "a hope and a prayer" without some scriptural basis, but maybe that's my bookish bias, or latent Anglicanism surfacing! It's certainly not a comfortable economic climate for many people at the present time, but I for one feel a little more optimistic about the social and environmental aspects of Australia's governance than I did during the Howard era. Yep Sal - you ask a tough question. I was being both provocative and hypothetical, but if such a conflict did arise a Catholic answer to it would be to "go to the tradition" (ie the church, the creeds, the councils etc). That's not necessarily where I was pointing, but it is another perspective. I was partly trying to use scripture (John 5:39-40) to show that scripture deliberately limits itself. It's also partly in response to Sydney Diocese, which is sometimes claimed to worship its own Trinity - "Father, Son & Holy Scripture". I don't know that there would ever be a "conflict" between Scripture and Christ - God speaks authoritatively and doesn't change, so any apparent conflict would either be misunderstanding or -interpretation, or would not be of Christ. I agree that the Scriptures are silent in lots of areas, and that we then need to go to tradition or reason, but never that either of these could prevail over clear Scripture. I also think that the John passage condemns/criticises those who study Scripture without allowing it and Jesus to transform them - those Pharisees who knew the Scriptures but didn't recognise the truth of Jesus or allow that truth to affect them at all. I don't reckon that passage of itself talks about a conflict between Jesus and Scripture. I loved your essay, though. I get so frustrated with the smug Christian voter whose view is that there is only one Christian way to vote. The idea you touched on about the American religious right and their "the enemy has a face" etc. The religious seem to conveniently forget that God used foreign nations to discipline his people when they strayed, but never in the OT seemed to use Israel to bring foreign nations to account. It's "holier-than-thou" writ large, which is offensive when it's an individual attitude, but offensive and dangerous when it's a national mind-set. Pray that Australia has got off that simplistic, religioulistic track - although I'm not sure we can write that off se easily just now.